The Zeus 3 slot is in a thunderous mood, with an astonishing 192-paylines up for grabs. Huge multipliers and a host of free spins available, in addition to an expanding wild reel make the 3rd instalment of Williams Interactive slot machines worthy of being named after the Greek God Zeus. Williams Interactive brings a familiar face back to our screens in the Zeus 3 slot machine 192-payline reels. 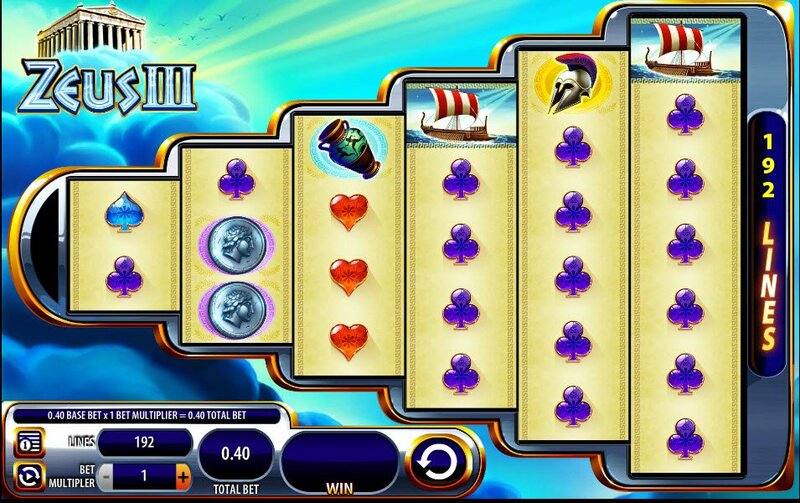 We all know that the third in a trilogy always has the potential to be disappointing and not live up to its previous efforts, so we will review Zeus 3 slot machine for you so you don't have to face any potential disappointment. Williams Interactive may not be the leaders in the industry when it comes to graphic quality, but they are certainly at the forefront when it comes to innovation and new takes on old favourites. The WMS division benefits from years of experience on the casino floor and boy do they know what players want! 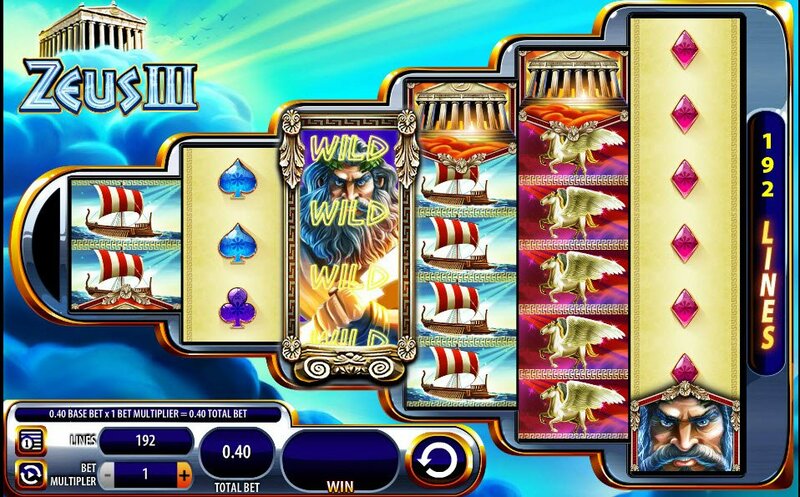 Set out across 6-reels, the 192 Zeus slot machine paylines tempt you into their world of reality mixed with fantasy. Winged horses, gods, a rod to control the weather, all lined up next to everyday objects from history and sea travel. The expanding Wild Reel and potential 50 Free Spins at a 50x multiplier make this online slot machine reviewer give a big thumbs up. Zeus is myth combined with reality to give you every opportunity to drift away on the extensive amount of paylines available and potential winnings for your gleeful spinning. From the stacked reels themselves, starting at 2 symbols visible on the first reel, 3 on the second and so on, until we reach 6 symbols visible on reel number 6, the 192 potential winning combinations will have you needing mythical Greek gods in order to work out how they have mastered this feat in slot machine play. In addition to the overwhelming amount of paylines available to win on in the Zeus 3 slot machine, there are some other treats to keep your eyes peeled for. While usually the sequels don't live up to their predecessors, Williams Interactive have certainly given Zeus a good makeover before popping him back into the game. 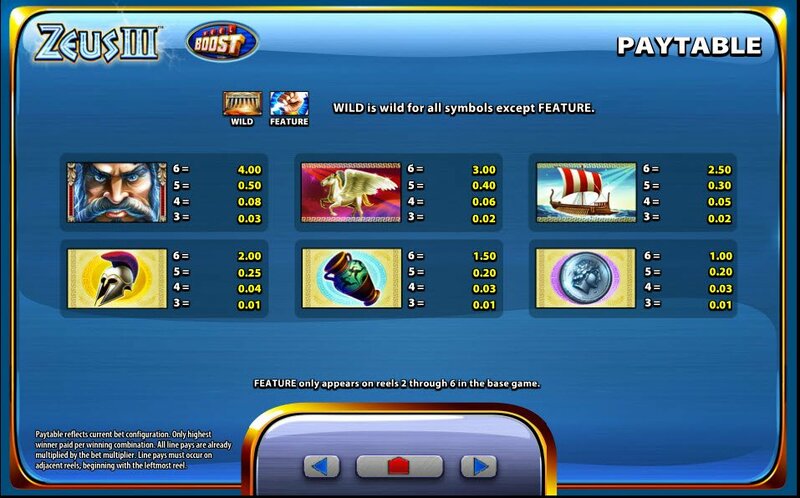 The expanding Wild Reel and potential 50 Free Spins at a 50x multiplier make this online slot machine reviewer give a big thumbs up.